look at these beautiful dolls originally manufactured by french company jouets petitcollin, a 19th century corset boning and comb manufacturer. 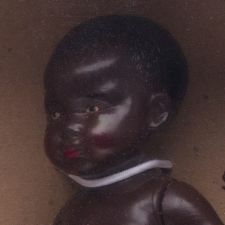 dolls of that era were frequently made of porcelain or papier mache, materials prone to damage. 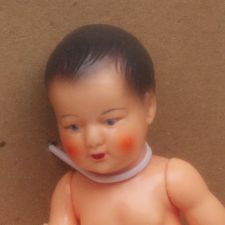 when petit collin began using celluloid as a material for a variety of products, they tried making dolls, and quickly became one of the world’s most renowned doll manufacturers in the early 20th century. now a special collection has been selected and mounted on wood as a keepsake of times past. i loathe the plastic rings around the close up photos so much i cannot even tell you, but despite this distraction, it sure is an intriguing addition to a collection. $185 for the set at moss. I agree, that thing on the doll’s neck is really destructing…they should have thought of a better technic to stick them up in those frame. i know – isn’t it ugly? it’s really too bad they had to do that to keep them in the box! What are they for? I moved into my apartment and they’d been left here and I was totally surprised by them. The plastic rings are very freaky! Are they rare?? well, i don’t think they’re rare, but they do have a rich history. 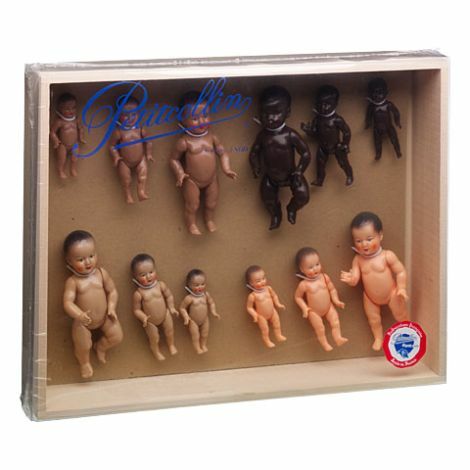 this company really revolutionized the way dolls were manufactured many years ago. really, they are for playing and collecting and loving. that is so weird that someone left them in the apartment. maybe it is meant to be that YOU are to cherish them!